Signamancy is a branch of magic that deals with the connection between something's appearance and its inner nature. Erfworld's puns and Real World references are a form of natural Signamancy. One of the things Signamancy impacts is the appearance of units, which reflects their predisposition or personality. Jillian: Became queen and began to lose some of her lean warrior muscle appearance. Looked fuller and more "royal." With the lost muscle tone she acquired a grace in her posture. Slately: Claimed that signamancy was a terrible curse. It revealed his true nature, "No unipegataur-riding warrior king was he, no towering leader and orator." Since he avoids battle and allows his chief warlord and other princes run the kingdom for him, he has shrunk, gotten fat, and his hair has started balding and turned white. Also, other leaders appearance reflect a less vigorous lifestyle and may be due to signamancy. Don King and Al Frappacino. What effect if any it might have on Stanley (a non-Noble Infantry Unit promoted up through the ranks to Overlord) are unknown, but his stature seems the same as in flashbacks and he is known to still engage in combat on occasion (such as taming dwagons). It's possible that Stanley's appearance reflects that he acts like a spoiled child. Gaining Ashen skin is another form of natural Signamancy some get after enduring great hardship. Contracts fall under Signamancy and Signamancers are often used as lawyers. An excellent taste for design aesthetics. Jillian states in IPTSF Text 30 that sides with Signamancers tend to have the nicest looking capitals. Can make structural alterations to a city. Have a strong understanding of contracts and can create contracts with magically enforced penalties, such as the transfer of schmuckers, units, and/or cities. The magic inherent to the contract itself is capable of judging when a violation has been made. Can enchant books into magic items. Can make a book that only allows people falling into certain categories to read or edit it.LIAB Epilogue 22 In the case of Parson's notebook, anyone other than him will see gibberish the book drew from his own experiences. Can publish books, allowing them to be randomly popped in any city that has or expands a library. Can enchant magic items which produce minor improvements in a units signamancy. Janis is a Master Signamancer. Brother Labeler, formerly of Faq, before its fall. Byrne the Notist of Ünderclock. Delphie Temple uses a cosmetic Signamancy spell as a make-up, probably of her own design. A Jetstone caster (presumably Ace Hardware) applies war paint to King Slately in order to give him fearsome Signamancy. A caster link between Labeler and Charlie was able to create the Deal of a Lifetime, a powerful contract that is difficult to break and carries a physical cost when its terms are strained at. Hippiemancy is the magic of relationships: detecting and altering the forces of opposition and attraction which bind people or units. While no actual Signamancers or Signamancy has appeared in Erfworld canon yet, we can infer some things about the discipline's nature from indirect comments on it. Author and creator Rob Balder has said about Signamancy, "Signamancy. Like the Peace sign, man. Like the protest sign, man. Signs, signs, everywhere a sign. Far out." The precise meaning of this is unclear; however, he is drawing a direct link between a visible symbol or word and a desired result. This is further strengthened by the nature of Signamantic philosophy - that all physical appearances are simply symbolic manifestations of the underlying "truth" of Erfworld.Erf-b1.5-p037 Based on these, it seems that Signamancy is in some way concerned with the relationship between "real" things and the symbols that represent them - the relationship between the map and the territory, so to speak. Signamancy is also a Hippiemancy, which may indicate certain things about the flavor and details of the discipline, but since no other Hippiemancy is adequately described as of now, it is hard to draw concrete conclusions from this connection. Maybe the Hippiemancy aspect of Signamancy is related to the way appearance affects the relationship between people, triggering immediate attraction or repulsion. Signamancy would be used to manipulate appearance, creating fake Signals and generating a desired effect (causing fear with warpaint, causing attraction with cosmetic Signamancy...). There has been some speculation about Parson being a Signamancer, based on the above clues and Janis's claimErf-b1-p140 that he's some kind of Hippiemancer. As Signamancy supposedly deals with the relation of what is seen and what is there it's likely that Signamancers are at least good at psychology if it's not actually included in the abilities. Signamancy may also lend itself to forms of divination, wherein one asks questions and uses APPARENTLY random factors- such as dice rolls, drawing symbols from a container, cards, runes, what have you- and interpreting these as signs of what shall come to pass; if so, this would relate to the fate axis indeed. Signamancy might be the bridge between the Erf and Fate axises. 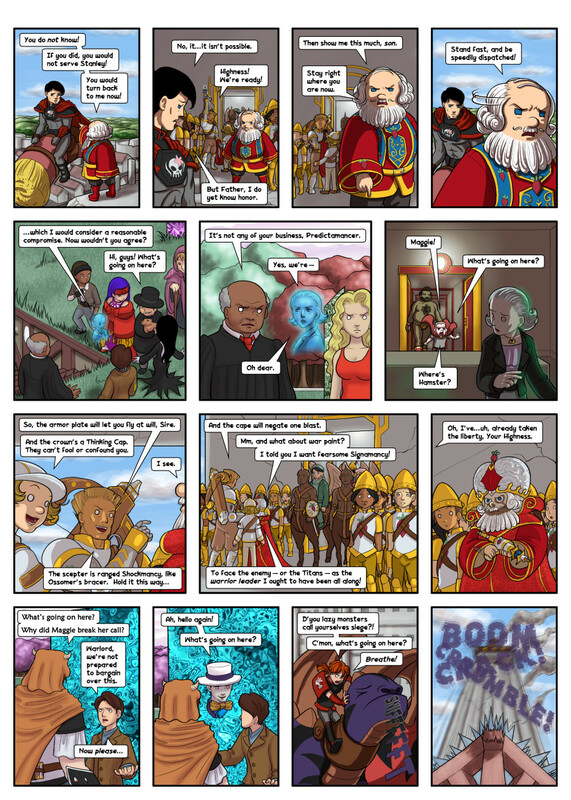 As a metaphorical example, if Fate were the "computer" on which Erfworld runs, Erf would be like a "touch screen", mostly just reflecting the computer's contents, but also on some limited level allowing two way interaction. Signamancy would be the "graphics software" (i.e. Fate magic) that decides how the "touch screen" should display the "computer"'s contents. Signmancy may have to do with refusing the intangible rules, as in a protest with signs where units seeing it are caused to have to 'roll against loyalty/duty' and on a fail be able to disobey orders without popping out of existence. A units appearance is based on Signamancy, and this seems to include their apparent age. For example, Isaac is one of the oldest units known, and yet looks like a middle aged man. Slately is younger, but looks like an old man. Ships and units also have signs, signals, and livery to show that they represent a certain group or idea. Ships, as in the real world, must communicate ideas and describe dangers and obstacles using flags and other signals. These ideas and signals are described in a book that Duke Forecastle reads in his story. It is possible that a signamancer can interpret and counter or even imitate signs of other sides. This would, in theory, allow them to confuse enemies with false information or hide a groups' identities and/or their intent, ie, like a false flag operation. This may allow units to stay incognito long enough to allow a unit to get close enough to launch an attack or sneak by an enemy element. This would make them a non-illusionary equivalent of a foolamancer which, while being more limited, may require less juice (a unit would simply need to change into a different uniform or raise a different flag instead of having an illusion made out of manipulated light particles). Signamancers can create coded messages for each other, juice-free, in the form of Rebus puzzles. Since the messages do not automagically appear as language to the intended recipient, but as the same symbols and pictograms that everyone else sees, there is no cost in juice for their creation. Also, analogous to Buddhist Enlightenment/Awakening in general  particularly in light of Signamancy being an discipline of Hippiemancy with a sister discipline of Flower Power. For example that "The Signamancers claimed that all Stuff was Foolamancy." Erf-b1.5-p037 (note capitalized "Stuff" and "Foolamancy") is perhaps a paraphrasing directly the phrase "the world is illusion" as it is often expressed from an Enlightened perspective. Many suspicious "coincidences" related to Fate occur in Erfworld, which may be a form of Signamancy that references Synchronicity. Synchronicity refers to the experience of multiple events that are connected by meaning, even if not by causality. This page was last edited on 10 November 2018, at 09:06.